This elegant and posh pet house is perfect for the city pooch (or cat)! Truly adorable and constructed with tender loving care by artisans who love and understand dogs and cats! Fully insulated to keep your dog warm in winter and cool in summer. 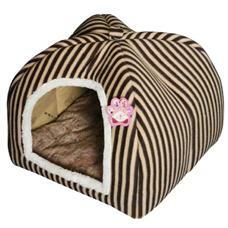 Your pet will certainly enjoy sweet dreams in his adorable dog house! Fashionable color matches any room décor. Isn't it about time your darling pet has his or her own house?